Colossians 3:12- Therefore, as God’s chosen people, holy and dearly loved, clothe yourselves with compassion, kindness, humility, gentleness and patience. Take a moment to meditate upon what it means that we are God’s chosen people that are Holy and Dearly Loved by God! If we are to “clothe” ourselves with compassion, kindness, humility, gentleness, and patience how should we look? What “style” are we sporting if these are our clothes? 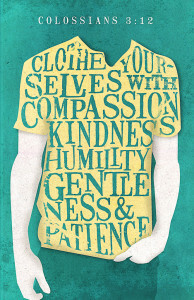 What are some ways you are already dressed with these character traits? What are some very specific opportunities the Holy Spirit is presenting for you to exercise compassion, kindness, humility, gentleness, or patience?